Researchers at Perdue University and the University of South Carolina have identified and characterized the glue that holds an oyster reef together. Oysters use a hard calcium carbonate cement that is somewhat similar to the hard shell material. If you have pried these babies apart you know it can be very strong. In comparison other species such as the mussel use a soft elastic material. Calcium carbonate is a chemical compound with the chemical formula CaCO3. It is a common substance found in rock in all parts of the world, and is the main component of shells of marine organisms, snails, pearls, and eggshells. Calcium carbonate is the active ingredient in agricultural lime. It is commonly used medicinally as a calcium supplement or as an antacid. The potential of the beneficial impacts of oysters and their calcium carbonate should not be ignored as a tool for fighting ocean acidification. In 1989, a researcher, Ken Simmons, introduced CaCO3 into the Whetstone Brook in Massachusetts. His hope was that the calcium carbonate would counter the acid in the stream from acid rain and save the trout that had ceased to spawn. His experiment was a success. This shows that CaCO3 can be added to neutralize the effects of acid rain in river ecosystems. Since the 1970s, such liming has been practiced on a large scale in Sweden to mitigate acidification and several thousand lakes and streams are limed repeatedly. Is it not logical step to think that the presence of large amounts of oyster shell could have a similar impact on a tidal estuary? To see the original article on the NSF website you can click here. 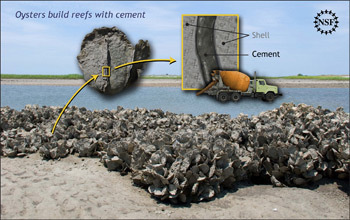 Oyster Cement Characterization Article. The researchers presented their findings at the 2010 Annual Meeting of the American Chemical Society in Boston, and will publish their results in the Sept. 15, 2010, issue of the Journal of the American Chemical Society. To learn more go to glue abstract at The Journal of the American Chemical Society. In late August, this little fellow was spotted in the wonderfully designed museum complex in Valencia Spain. 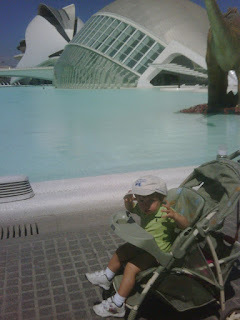 You can see two of Calatrava's architectural gems in the background. 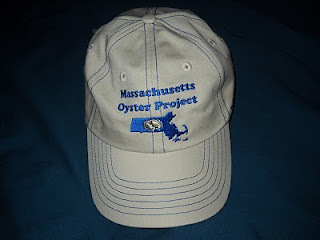 Wearing Mass Oyster Project clothing helps our oyster restoration effort in two ways. First, it helps to raise awareness of our groundbreaking work. You would be amazed at how people are interested in oysters and making the Harbor cleaner! Second profits help fund the purchase of oysters and other materials. An added benefit is that it makes the wearer look stylish. We have hats ($14) and windbreakers ($25) in stock. We will be ordering t-shirts for sale at Fall events shortly. 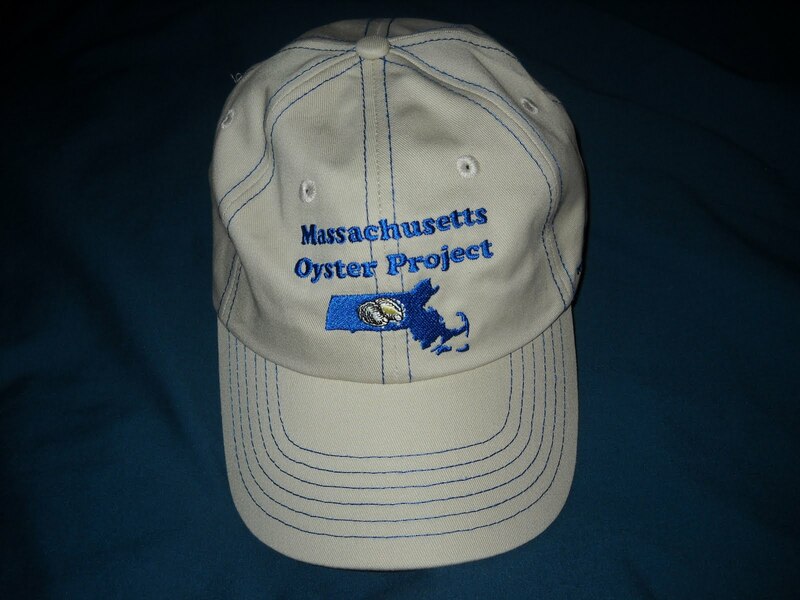 To order send an email to massoyster@gmail.com. 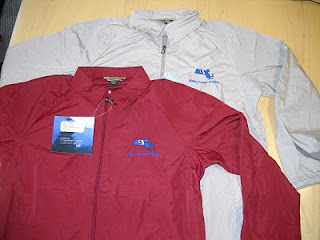 Our web-site has recieved numerous hits referred from a posting on hulltruth.com, a boating web-site. There is a great story there about a person's effort to restore some oyster coastline in the Chesapeake Bay using shell from a restaurant. It is an impressive effort by one person. By placing shell they are giving a substrate for the floating infant oysters to settle on. In that Bay they have an advantage in that the oysters have a natural set in which the existing population reproduces and the young are floating throughout the bay. We don't yet have that in Boston Harbor, so it would not work here. But hopefully in the not-too-distant future we will have some reproduction. 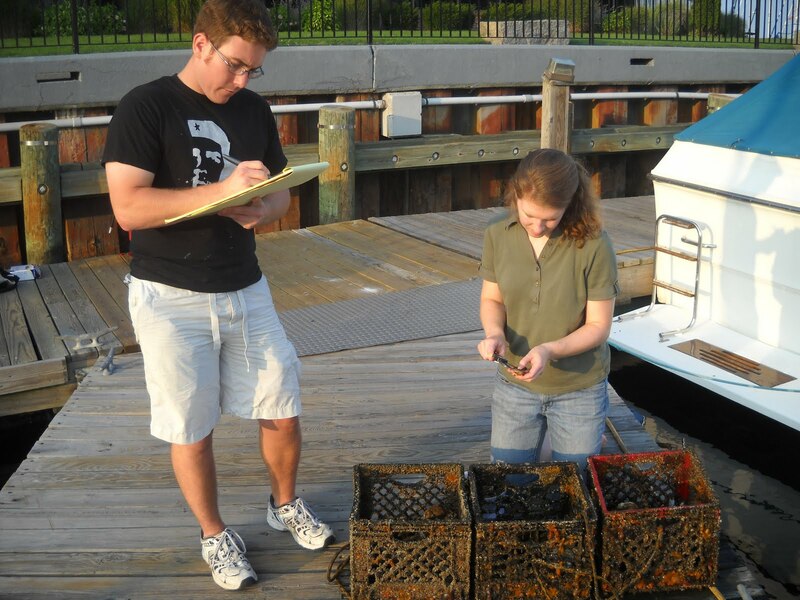 In the meantime one of our volunteers, Ben is exploring how we might get approvals to put down shell in the harbor. Working through the regulatory process is not simple, however we do have serveral sources of oyster shell when that situation arrives. 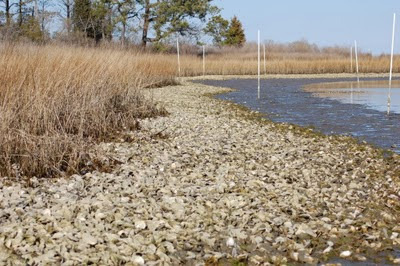 It appears that the State of New Jersey has thrown a monkey wrench into the ongoing oyster restoration effort of the NJ Baykeepers group. This organization has been active for several years with numerous initiatives and MOP has drawn on their expertise. The State of NJ has ordered them to remove their oysters from Raritan Bay. The State is saying that the FDA views this as a threat to the oyster industry as illegally harvested oysters from polluted waters could get in the food chain. We view this as sad and unfortunate. Doesn't NJ license all oyster harvesters? And don't restaurants purchase their oysters from reputable dealers? There are all kinds of things that can be pulled out of the ocean's polluted waters that should not be eaten. In Massachusetts we have steamer clams in polluted Marshes. Are unsafe ones winding up in the food system? No because our State's Division of Marine Fisheries has posted areas, supervises the industry, and has a plant to detoxify steamer clams that are harvested from questionable waters. Doesn't it seem odd that the FDA is focusing on this when last year hundreds of people were sick from toxic peanut butter? Fortunately, New York does not appear to be following New Jersey's path. To learn more, you can read the article in the New York Times below. It has been an exciting time for the Oyster Project. 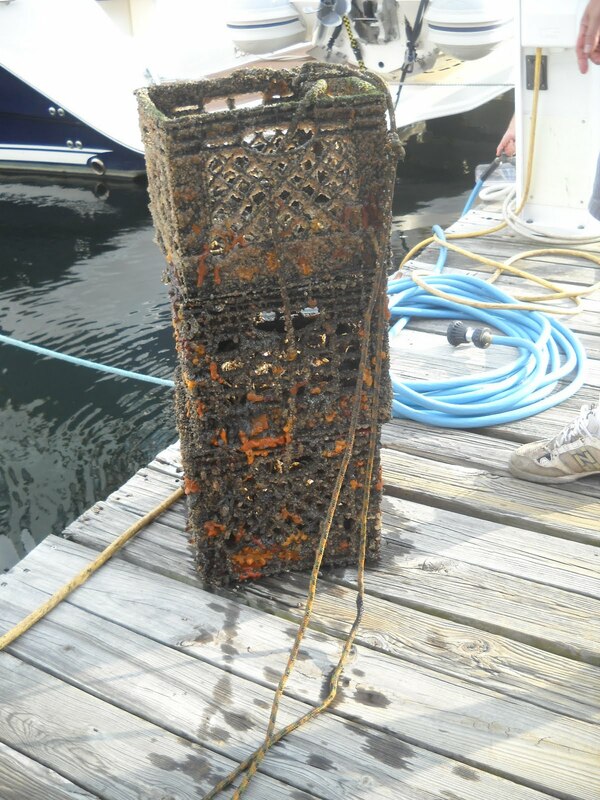 Mortality has been very low in the oysters we placed in cages last fall and, in some cases we have seen substantial growth. 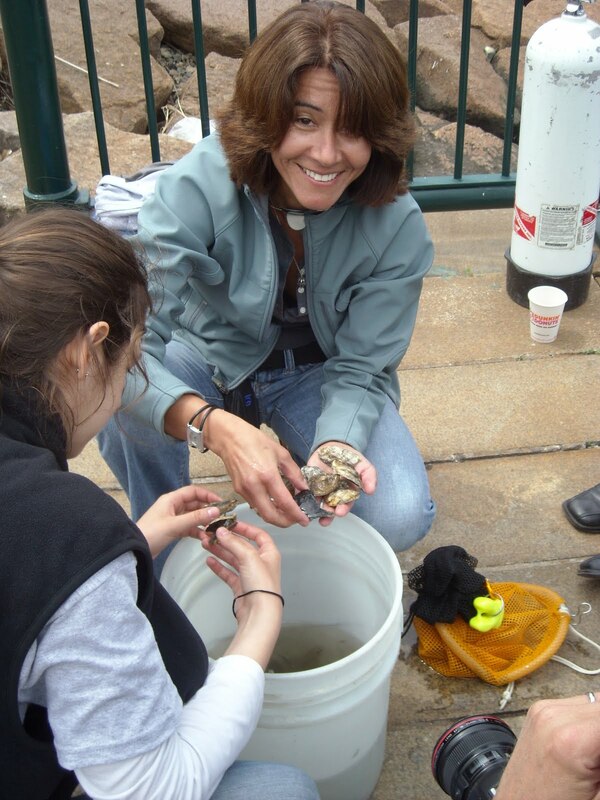 Our volunteer divers and measurers have had some excitement including our first 4 inch long oyster! Size matters because reproducing size is considered to be 3 inches. So if we can get them to that size, then there is hope for a reproductive event when the water gets warm enough. Interestingly, once the oysters get to be around that 3 inch size the growth tends to shift more to thickness. It is fascinating to watch. We have been sharing data with our regulators at the Massachusetts Division of Marine Fisheries. 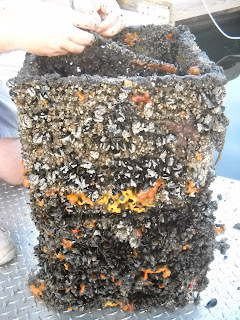 So, we are beginning to generate data indicating the oysters can survive and grow in the harbor. Two of our larger oysters. The left is more the classic tear drop shape. On the other hand, we have not yet shown reproduction, although we placed an impressive specially designed device for young oysters to settle on should they be created. (Thank you Dave!) 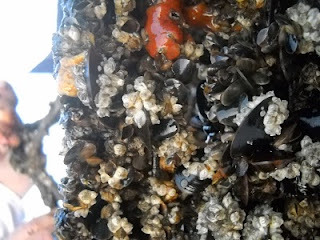 And we did see extensive predation of our loose oysters by starfish and crabs. (They like eating oysters too!) This will need to be considered as we seek to establish a self-sustaining population. Here is Dave with the apparatus. and the medicine ball like floats that support it. In the lower right of the photo you can see the "cages" we place oysters in on the bottom. 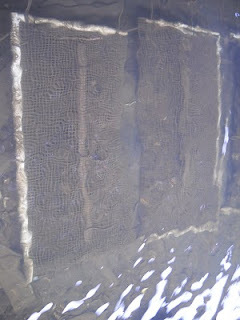 Overall, we are pleased with the progress from an oyster front and we are learning a lot! 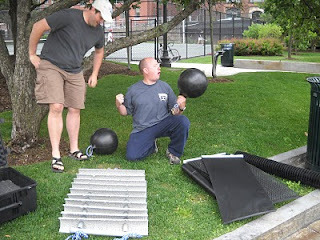 How to place the oysters, methodologies for measurement, apparatus that can be used, etc.